Pros: Everything about it is fantastic it hits great, cleans well, and is very durable. Cons: My on con is they need to be restocked!!! Soon!!! Please. Mine broke because I was careless. .
Pros: prompt customer service, super fast shipping, and a great quality product! 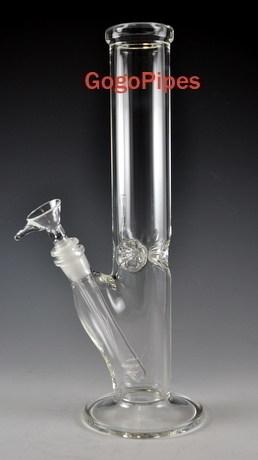 Pros: Perfect pipe nice thick glass and a low price. Everything you need and nothing else. Pros: Smooth yet hard hitting! Excellent pipe for the money. Pros: Durable piece. Hits smooth and just is overall perfect. I love it definitely worth it! You won't be disappointed. Pros: BEST PIPE IVE OWNED. SUPER cleaner friendly, the primary reason I wanted this one. I couldn't be more pleased...No little crevices for the tar to get stuck in. Pros: thick glass, good rips, perfect size and at the price they give you is grrrreaaat! Cons: the hole in the bowl is to big, i'd get some glass screens or a new bowl. Pros: This pipe is a perfect size, very thick, and well made. Amazing hits so smooth through the diffused down stem.